This time, the opposite of the last review - a shop with a lower ranking on Supleks that I do not think is deserved. 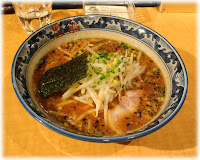 Takaraya is down the street going west from the venerable Horiuchi, just north of the Shinjuku Bic Camera. 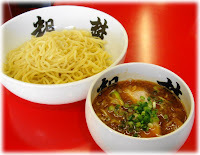 They do a very rich and salty, deeply-colored shoyu-base broth with just a hint of spiciness. They also offer some cuts of pork that are not normally seen - I ordered the aburi chashu tsukemen (special kanji for this one, 炙り叉焼つけ麺), and it came with a giant almost 1-inch thick slice of some of the tenderest pork I have ever had, I was able to cut it easily with the chopsticks. Just looking at it made me think of beef prime rib, that was a good approximation of the texture and softness. You also get a flatter rolled piece, and both pieces were freshly grilled with burn marks. The noodles were interesting, they were wider than linguine but thinner than pappardelle, and a very generous portion, I didn't ask but it must have been more than 300 grams. Add to this some very thick menmas and I think you have a winner. 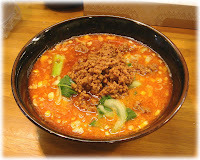 The main complaint, if you want to make one, might be the price, at 1200 yen this is at the extreme upper-end of the ramen scale, discounting one-offs like the 10000 yen ramen at Fujimaki Gekijo. Listen to the sing-song greeting of the waitress as she greets you.